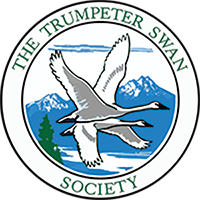 In 2009, Trumpeter Swans in Iowa reached a record high of 33 nest attempts in the wild. The initial goal of the Iowa Department of Natural Resources was to establish 15 nesting pairs of wild Trumpeters. With over 95% of Iowa's original 2½ million acres of wetlands drained and converted to cropland, Iowans have cause for celebration. The return of these once extirpated swans to the skies and wetlands of Iowa is very promising. Every nest attempt is exciting in Iowa but one nesting effort this year is particularly noteworthy. A pair of Trumpeter Swans nested and hatched 6 cygnets on a restored wetland on an Iowa State University experimental agronomy farm, "trumpeting" the successful partnership of agricultural interests and wetland conservation, while the farm raised record amounts of corn and beans.